Support our 2016 GOTV efforts to elect Democrats by becoming a Davidson Hyde Dinner Host (Congressional, Senatorial or Presidential Circle), even if you are not attending the Dinner. The first annual Davidson Hyde Dinner is being held in conjunction with the Democrats Abroad 2016 Global Convention and Global Meeting in Berlin May 12-15. The Dinner is named after the two founders of Democrats Abroad, Al Davidson who lived in France and Toby Hyde who lived in the United Kingdom. 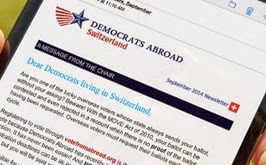 Together with others, they founded Democrats Abroad in 1964, and worked hard to make it the global organization that it is today – giving all overseas Americans the right to vote.